Mirko Augery at CSO Yachts tells me he's taken over the central listing for sale on the 29.8m motor yacht Elixire with a €460,000 price cut. Built by Mondo Marine in 1995 and refitted in 2012, Elixire accommodates eight guests in two double and two twin staterooms while two 1,950hp diesel engines give her a cruising speed of 15 knots and top speed of 20 knots. 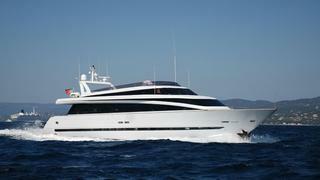 Complete with a proven charter history, she's been well maintained and is in turnkey condition. Lying in Hyeres, France, Elixire is down from €1.4 million to €940,000.